Short history of my opinion of watermelon… I hate it. On the flipside of the previous statement I tend to like watermelon flavored things. It’ll be interesting to see which column today’s soda falls. 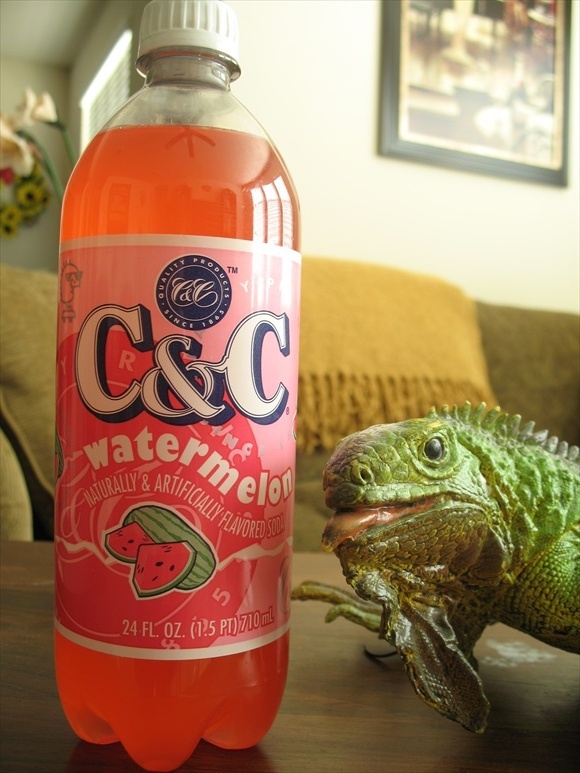 Oh, by the way, today’s soda is C&C Watermelon. That was kind of like the hit TV series Flash Forward wasn’t it? You saw the thoughts that should have come after the soda reveal BEFORE the soda reveal and yes I know that Flash Forward was not a hit TV series. Aerosmith would do well to mention C&C Watermelon in their radio hit “Pink” as the label, soda, and label again are all varying shades of half of the color of watermelon. The label even has cute, I guess fruit can be cute, little watermelons on it that make me want to drink this just a bit more. Onward! A watermelon/grapefruit smell punches me in the nose as soon as I twist the cap. Thankfully watermelon is the clearly dominate scent as the grapefruit seems to just be there for a little filler. Hopefully the flavor will mirror the aroma. C&C Watermelon is much fizzier than I expected as the bubbles seem to run with razor blades down my throat. This is a good thing even though it sounds horribly painful. Just like the scent the watermelon flavor takes charge as his tiny buddy grapefruit holds on for dear life just hoping to not get noticed. If you’ve ever had a watermelon Jolly Rancher then you’ll be familiar with the taste of C&C Watermelon. While the sweetness level isn’t quite that of hard candy it’s still plenty sugary and very enjoyable. Each sip I take begins with a quick burst of what I would consider a fairly authentic watermelon taste which thankfully (in my opinion) is covered up by the safer candy flavor previously mentioned. I have to give credit to C&C for even trying this flavor. So many companies could be making watermelon soda, but don’t because it’s too high risk. C&C, with their myriad of flavors, thankfully decided to include watermelon in their arsenal. This soda is different enough, bubbly enough, sweet enough, and tasty enough for me to recommend you give it a try. Of course if you don’t like any kind of watermelon then you may want to sit this one out, but if you’re a fan of the fruit or the candy fruit then I definitely think it’s worth a shot. This beverage supplied to us by C&C. Although you wouldn't think it, Twist hates any pink and green color combo. He's more of a blue and white kinda guy.